If you think about it, there is a lot of maths in board games, simple math although it may be. We are always counting something while playing: number of turns, coins to spend, victory points, a probability of a dice roll. Star Plus ups the tabletop maths game by introducing negative numbers to the addition process. It is as ‘exciting’ as it sounds. 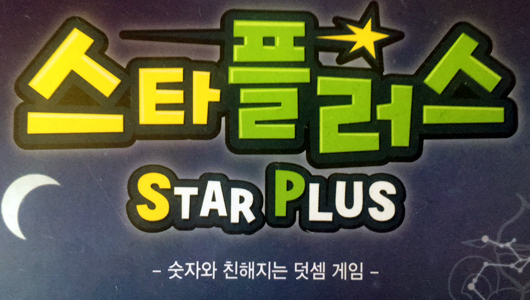 In Star Plus, players are trying to be the first to discard all cards from their hand and get the most points. 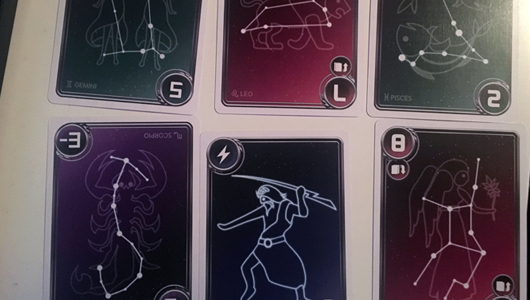 Each card has a number, from 1-9 and from -3 to -1, as well as Zeus joker card. Throughout the game, players will be adding the numbers on the cards together to produce the sum required by that round. If they successfully manage to come up with a correct number, these cards will be discarded and counted as points towards the end of the game. If unable, that player will pick up more cards. There are also other miscellaneous rules to spice up gameplay. One of them is called The Black Hole and it requires a player to put down three cards or more to successfully complete the round. As a penalty, they pick up more cards from the draw pile. There are also cards that will let you steal from discard pile of your opponents or reverse the direction of play. In general, the mechanics work. Every round you discard a bunch of cards, then pick up a bunch more cards. Occasionally, there is an opportunity to mess up your opponents by stealing cards from them or trigger The Black Hole, knowing that the player after you will be unable to discard three cards and will have to pick up instead. However, most of the time it feels as if the game is taunting you, providing the tools that encourage planning and strategy but without any opportunities to do that. Sure, you may steal a card from the opponent, but the next round, you draw more random cards and its a matter of luck if they have the number you need. So whether you win or lose depends entirely on chance. However, Star Plus’ biggest offense is that there is nothing exciting about it. Its mechanics – granted they are simple enough – offer nothing new or challenging. Cards with a negative value – one of the more interesting parts of the game, are not numerous enough in the deck to really provide any kind of difference in the game. If you play with a large group of people, there is a high chance that you might not get any of them at all. There are no bonuses for collecting a certain type of cards and the only penalty is for having cards in your hand at the end of the game. Even the special powers cards do very little to change the course of the game. As one might gather from the name, stars or rather constellations, are the overarching theme of the game. This is relevant to nothing except the game’s simple artwork and, if really stretching it, the reason behind the numbers 1-12 that determine the sums to be discarded every round, 12 being the number of zodiacs. Star Plus’ best quality is that it is short and simple. The rules can be taught in about two minutes and the game itself can be played in about ten minutes, despite it stating 20 minute play time on the box. Games never feel drawn out and the rounds are quickly paced. 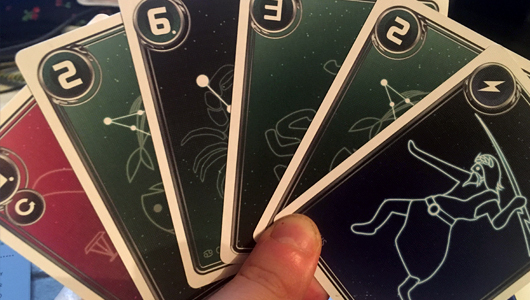 Part of the appeal of smaller card games, like Star Plus, is that after playing one, it is so easy to have another round. Unfortunately, nothing in this game really inspires me to do so. There is really nothing I could do to improve or a way for me to make a better play. I cannot even blame my loss on a silly mistake because unless I add two numbers wrong, there is not much I can mess up. It is really a great shame because this is a perfect travel game. The box is small enough to be taken on trips and the rules very accessible and friendly to new players. It could have easily joined the ranks of Sushi Go!, Dragon Punch, Love Letter and Star Realms, all small, easy to learn card games that almost always travel in my bag with me. Unfortunately, the stars have not aligned for Star Plus. While I can commend it for its simplicity and accessibility, there is nothing else that appeals to me about this game. Maybe, if you have young children who are learning addition, this game could be used as an alternative tool. Otherwise, there is a whole host of other small card games that offer more interesting and rewarding gameplay. Tags: Card games, Dragon Punch, Korea Boardgames, Love Lettter, Park Tae Woo, Star Realms, Sushi Go!